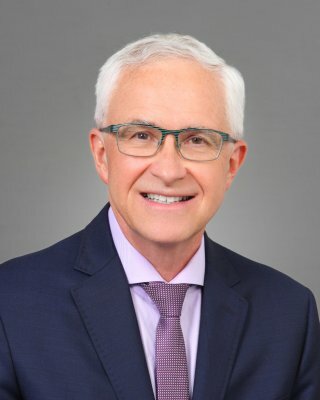 Dr. Srigley is the Chief and Medical Director of the Program of Laboratory Medicine and Genetics at Trillium Health Partners, and a Professor in the Department of Laboratory Medicine and Pathobiology at the University of Toronto. He also represents Canada on the American Joint Committee on Cancer. In addition to his role as Expert Lead, Pathology, Dr. Srigley is Chair of the Cancer Care Advisory Committee for the Canadian Association of Pathologists. Dr. Srigley is a graduate of the Faculty of Medicine, University of Toronto, where he also received anatomic and ontologic training, which he continued at MD Anderson Cancer Center in Houston. Previously, Dr. Srigley was the inaugural Head of Pathology and Laboratory Medicine Program at Cancer Care Ontario. Dr. Srigley is a past President of both the International Society of Urological Pathologists and the Ontario Association of Pathologists. Dr. Srigley was a key leader in completing the Canadian Partnership Against Cancer’s National Staging Initiative and securing formal endorsement of the College of American Pathology cancer checklists as pan-Canadian content standards for cancer pathology reporting. 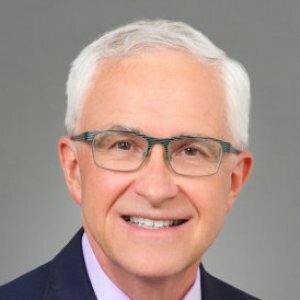 An international consultant and educator in the fields of oncologic and urologic pathology, Dr. Srigley has contributed extensively to the literature and strongly advocated for population-level standardized synoptic pathology reporting as well as the role of the pathologist in cancer control. Key quality parameters in diagnostic pathology include timeliness, accuracy, completeness, conformance with current agreed standards, consistency and clarity in communication. In this review, we argue that with worldwide developments in eHealth and big data, generally, there are two further, often overlooked, parameters if our reports are to be fit for purpose. Firstly, population-level studies have clearly demonstrated the value of providing timely structured reporting data in standardised electronic format as part of system-wide quality improvement programmes. Moreover, when combined with multiple health data sources through eHealth and data linkage, structured pathology reports become central to population-level quality monitoring, benchmarking, interventions and benefit analyses in public health management. Secondly, population-level studies, particularly for benchmarking, require a single agreed international and evidence-based standard to ensure interoperability and comparability. This has been taken for granted in tumour classification and staging for many years, yet international standardisation of cancer datasets is only now underway through the International Collaboration on Cancer Reporting (ICCR). In this review, we present evidence supporting the role of structured pathology reporting in quality improvement for both clinical care and population-level health management. Although this review of available evidence largely relates to structured reporting of cancer, it is clear that the same principles can be applied throughout anatomical pathology generally, as they are elsewhere in the health system. Grading is an important prognostic parameter for prostate adenocarcinoma and renal cell carcinoma (RCC); however, the most frequently used classifications fail to account for advances in our understanding of the diagnostic features, classification and/or behaviour of these tumours. In 2005 and 2014, the International Society of Urological Pathology (ISUP) proposed changes to Gleason scoring with the adoption of the ISUP grading for prostate cancer in 2014 (grade 1, score 3 + 3; grade 2, score 3 + 4; grade 3, score 4 + 3; grade 4, score 8; grade 5, score 9-10). Internationally the Fuhrman grading system is widely employed despite criticisms related to its application, validity, and reproducibility. In 2012, the ISUP established a grading system for RCC (grade 1, the nucleolus is not seen or is inconspicuous and basophilic at ×400 magnification; grade 2, nucleoli are eosinophilic and clearly visible at ×400 magnification; grade 3, nucleoli are clearly visible at ×100 magnification; grade 4, tumours show extreme pleomorphism or rhabdoid and/or sarcomatoid morphology). This grading has been validated for clear cell RCC and papillary RCC. It was further recommended that chromophobe RCC not be graded. For other morphotypes of RCC, ISUP grading has not been validated as a prognostic parameter, but can be used for descriptive purposes. The classification of renal cell neoplasia is morphologically based; however, this has evolved over the last 35 years with the incorporation of genetic characteristics into the diagnostic features of some tumors. The 2013 Vancouver classification recognized 17 morphotypes of renal parenchymal malignancy and two benign tumors. This classification included the newly established entities tubulocystic renal cell carcinoma (RCC)), acquired cystic disease-associated RCC, clear cell (tubulo) papillary RCC, microphthalmia transcription factor family translocation RCC and hereditary leiomyomatosis RCC syndrome-associated RCC. In addition to these newly described forms of RCC there are a number of novel tumors that are currently recognized as emerging entities. These are likely to be incorporated into subsequent classifications and include thyroid-like follicular RCC, succinate dehydrogenase B mutation-associated RCC, ALK translocation RCC, tuberous sclerosis complex-associated RCC, and RCC with (angio) leiomyomatous stroma. Treatment options for primary and metastatic renal cancer are increasing. Accurate data from the pathological examination of renal cancer specimens aid clinicians in stratifying patients for surveillance and adjuvant therapies. This review focuses on biomarkers in diagnosis, prognosis and prediction of the biologic behavior of renal tumors which should be recorded in pathology reports and which are under investigation. Special emphasis is given to the use of immunohistochemical markers in differential diagnosis of various renal tumor subtypes. The relevance of cytogenetic and molecular findings is also discussed. The review includes the 2012 International Society for Urological Pathology Consensus conference recommendations. The International Society of Urological Pathology 2012 Consensus Conference made recommendations regarding classification, prognostic factors, staging, and immunohistochemical and molecular assessment of adult renal tumors. Issues relating to prognostic factors were coordinated by a workgroup who identified tumor morphotype, sarcomatoid/rhabdoid differentiation, tumor necrosis, grading, and microvascular invasion as potential prognostic parameters. There was consensus that the main morphotypes of renal cell carcinoma (RCC) were of prognostic significance, that subtyping of papillary RCC (types 1 and 2) provided additional prognostic information, and that clear cell tubulopapillary RCC was associated with a more favorable outcome. For tumors showing sarcomatoid or rhabdoid differentiation, there was consensus that a minimum proportion of tumor was not required for diagnostic purposes. It was also agreed upon that the underlying subtype of carcinoma should be reported. For sarcomatoid carcinoma, it was further agreed upon that if the underlying carcinoma subtype was absent the tumor should be classified as a grade 4 unclassified carcinoma with a sarcomatoid component. Tumor necrosis was considered to have prognostic significance, with assessment based on macroscopic and microscopic examination of the tumor. It was recommended that for clear cell RCC the amount of necrosis should be quantified. There was consensus that nucleolar prominence defined grades 1 to 3 of clear cell and papillary RCCs, whereas extreme nuclear pleomorphism or sarcomatoid and/or rhabdoid differentiation defined grade 4 tumors. It was agreed upon that chromophobe RCC should not be graded. There was consensus that microvascular invasion should not be included as a staging criterion for RCC. The classification working group of the International Society of Urological Pathology consensus conference on renal neoplasia was in charge of making recommendations regarding additions and changes to the current World Health Organization Classification of Renal Tumors (2004). Members of the group performed an exhaustive literature review, assessed the results of the preconference survey and participated in the consensus conference discussion and polling activities. On the basis of the above inputs, there was consensus that 5 entities should be recognized as new distinct epithelial tumors within the classification system: tubulocystic renal cell carcinoma (RCC), acquired cystic disease–associated RCC, clear cell (tubulo) papillary RCC, the MiT family translocation RCCs (in particular t(6;11) RCC), and hereditary leiomyomatosis RCC syndrome–associated RCC. In addition, there are 3 rare carcinomas that were considered as emerging or provisional new entities: thyroid-like follicular RCC; succinate dehydrogenase B deficiency–associated RCC; and ALK translocation RCC. Further reports of these entities are required to better understand the nature and behavior of these highly unusual tumors. There were a number of new concepts and suggested modifications to the existing World Health Organization 2004 categories. Within the clear cell RCC group, it was agreed upon that multicystic clear cell RCC is best considered as a neoplasm of low malignant potential. There was agreement that subtyping of papillary RCC is of value and that the oncocytic variant of papillary RCC should not be considered as a distinct entity. The hybrid oncocytic chromophobe tumor, which is an indolent tumor that occurs in 3 settings, namely Birt-Hogg-Dubé Syndrome, renal oncocytosis, and as a sporadic neoplasm, was placed, for the time being, within the chromophobe RCC category. Recent advances related to collecting duct carcinoma, renal medullary carcinoma, and mucinous spindle cell and tubular RCC were elucidated. Outside of the epithelial category, advances in our understanding of angiomyolipoma, including the epithelioid and epithelial cystic variants, were considered. In addition, the apparent relationship between cystic nephroma and mixed epithelial and stromal tumor was discussed, with the consensus that these tumors form a spectrum of neoplasia. The stage of a patient's cancer at diagnosis is essential to predict the prognosis and plan the treatment. Since 2008, stage data have been collected on all Ontario patients with breast, colorectal, lung and prostate cancers and are linked to other data collected by Cancer Care Ontario. Here, an analysis of such data is presented. How it can be used to assess the value of screening programs, inform resource allocation, evaluate compliance with treatment guidelines, compare survival trends and enhance the spectrum of cancer control activities across the province is demonstrated. International comparisons can also be made. Health care organizations and professionals are being called on to develop clear and transparent measures of quality and to demonstrate the application of the data to performance improvement at the system and provider levels. 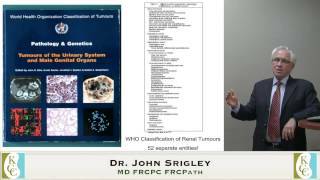 Major consensus conferences held over a decade ago laid the foundations for the current (2004) WHO classification of renal carcinoma. Clear cell, papillary and chromophobe carcinomas account for 85–90% carcinomas seen in routine practice. The remaining 10–15% of carcinomas consist of rare sporadic and hereditary tumors, some of which had been long recognized, but many of which only emerged as distinct entities in the decade leading up to the WHO publication. Collecting-duct carcinoma is a rare, often lethal form of carcinoma. Medullary carcinoma associated with sickle cell trait, has emerged as a distinctive tumor showing some overlapping features with upper tract urothelial carcinoma. Mucinous tubular and spindle-cell carcinoma and tubulocystic carcinoma were earlier considered as patterns of low-grade collecting-duct carcinoma, but are now recognized as separate tumor entities. Carcinomas associated with somatic translocations of TFE3 and TFEB comprise a significant proportion of pediatric renal carcinomas. Oncocytoid renal carcinomas in neuroblastoma survivors was recognized as a unique tumor category in the WHO classification. Renal carcinoma associated with end-stage renal disease is now recognized as having distinct morphological patterns and behavior. In addition there is a group of rare recently described carcinomas, including clear cell papillary carcinoma, oncocytic papillary renal cell carcinoma, follicular renal carcinoma and leiomyomatous renal cell carcinoma. It behooves the surgical pathologist to not only be capable of diagnosing the common forms of renal cancer, but also to be aware of the rare types of renal carcinoma, many of which have emerged in recent years.